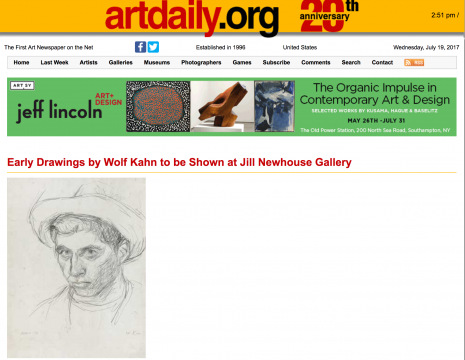 Jill Newhouse Gallery is pleased to announce an exhibition of previously unexhibited drawings from the 1950s by Wolf Kahn, one of the most influential and popular painters working today. A fully illustrated digital catalogue with commentary by the artist will accompany the exhibition. The drawings in the exhibition illuminate the ways in which Kahn pursued that ‘baby,’ representation, as a young artist in the 1950s, by adapting the idioms of early modernism to his own ends. These works reveal the world in which Kahn lived and travelled during this period. New York, Provincetown, Italy and Mexico appear in a diverse group of landscapes. 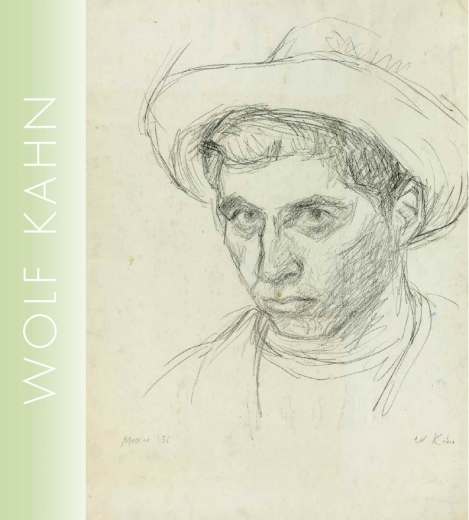 Portraits from life of friends, artists and writers such as Kahn’s wife, Emily and the poet John Ciardi, and offer a rare glimpse into Kahn’s way of capturing the personality of the sitter. A self portrait from 1956 turns on the intensity of the artist’s gaze, while a portrait of the artist Carl Sprinchorn of 1954 casts its subject in the mild light of a subtle personality. Sleeping Lioness of 1956 takes on Delacroix’s Romanticism, while still lives, interiors, and landscapes probe the examples of Matisse, Bonnard, Pissarro, Van Gogh, and Corinth. Kahn’s first drawing of a barn, from 1968, provides a valuable point of entry into the artist’s mature subject matter. “The role of drawing is, for the contemporary artist, a question each artist must solve anew.” Wolf Kahn – Early Drawings is an opportunity to see what this often-quoted statement by Kahn actually meant to him as a young artist making his way forward.